After a three hour drive from Cusco, we donned our walking boots and high factor suntan cream and started our trek in the beautiful Mollepata Valley. Here we walked through areas carpeted with stunning wild flowers, past water channels created by the Incas and gradually rose up to a plateau in the shadow of Mount Salkantay - one of the most sacred peaks in Inca mythology - and our home for the next two nights, the aptly named Salkantay Lodge. We were warmly greeted by the staff and furnished with hot towels and mint tea, a welcome pattern we came to enjoy at the end of every hike. The first night was a chance to get to know our newly formed group - Julian broke the ice and shook things up with a round of Pisco Sours. Our second day was for acclimatising, but that didn’t mean rest! We took a steep hike up to the glacier fed turquoise waters of stunning Humantay Lake spotting condors glide overhead and watching avalanches charge down the mountain side. At the top we donned local headgear (Julian was getting quite partial to his!) and took part in what turned out to be a very spiritual experience, a ceremony led by a local Queros Shaman giving thanks to the mountains and Mother Earth. Day three was the biggie. We set off in glorious sunshine but all that was about to change. We faced our challenge - a three hour heart pounding, deep breathing slog uphill - in wind, rain and sleet. Eventually the top was in sight; the Salkantay Pass, which at 4,630m, was the highest point we reached on our trek. The weather had closed in so after the “we’ve made it” photographs, we descended out of the gloom of the Pass and were met by an evocative scene reminiscent of the glens of Scotland with the clouds hanging low in the steep, green valley before us. The next two days saw us descend over 1,000m. The scenery seemed to change with every step we took from snow-capped mountains through verdant cloud forest full of hummingbirds, orchids and delicate butterflies to a canyon of coffee and banana plantations. We lunched on a Pachaman - a traditional festive Peruvian meal cooked by layering meat, potatoes and vegetables with hot stones - and tasted the freshest coffee, roasted and then ground before our eyes. When we thought there was no more up, we were hit with a short but sharp ascent on a three mile section of the Inca Trail to the recently restored ruins of Llactapata. But it was worth it when we got our first sighting; a rare side long view of the Machu Picchu complex, one very few visitors ever get to see. We then did a steep descent to the Santa Theresa River valley through lush bamboo forests and avocado orchards before boarding the train to the rather less than scenic town of Aguas Calientes, the gateway to Machu Picchu. Machu Picchu. It tends to be on the must-see list of every serious traveller and for good reason. Perched on a plateau between the two lofty peaks of Wayna and Machu (Picchu) the astounding ruins didn’t disappoint. 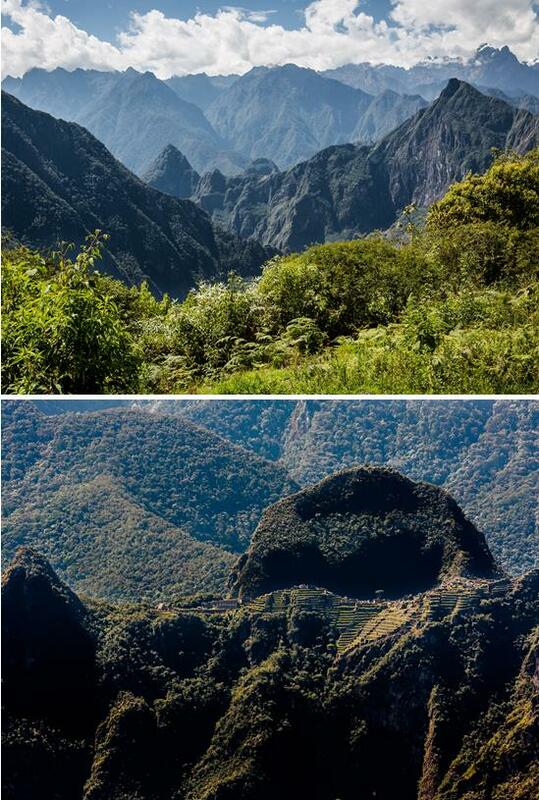 Neither did the view from the top of cone shaped Wayna Picchu where you get an “aerial” view of the whole complex. Julian and I climbed to the top in record time (the steep down was a little slower) but, after six long hard days getting there, it finished us off and we left the pastoral scene to the Llamas. Don’t get me wrong. The Inca trail is iconic and a totally amazing trek - you’ll never forget your first views of Machu Picchu from the Sun Gate as dawn breaks. But the reality is, you have to buy your permit exactly a year in advance or they sell out, almost immediately. And the first view as dawn breaks is likely to be shared with hundreds of fellow trekkers. The overriding memory of our Salkantay Trek, one that will live long, is the absolute splendour and diversity of the Peruvian landscape, which we shared with very few other people and which really did take our breath away. So, if you have the time to devote 6 days to a trek (as opposed to 3 for the Inca Trail), love the mountains and want the opportunity to delve more deeply into a less touristy side of Peru, then I’d definitely opt for the Salkantay Trek. Plus, if like me you’re way past sleeping on a hard floor in a cold tent, the lodge-to-lodge option is perfect. Let’s face it, you’ll still achieve your dream of reaching Machu Picchu on foot but, in much more comfort! For more information on the Salkantay Trek that Julian and I did, please do get in touch.